Because cells progressing to cancer must proliferate, marker proteins specific to proliferating cells may permit detection of premalignant lesions. Here we compared the sensitivities of a classic proliferation marker, Ki-67, with a new proliferation marker, MCM2, in 41 bronchial biopsy specimens representing normal mucosa, metaplasia, dysplasia, and carcinoma in situ. Parallel sections were stained with antibodies against MCM2 and Ki-67, and the frequencies of staining were independently measured by two investigators. Differences were evaluated statistically using the two-sided correlated samples t-test and Wilcoxon rank sum test. For each of the 41 specimens, the average frequency of staining by anti-MCM2 (39%) was significantly (p < 0.001) greater than by anti-Ki-67 (16%). In metaplastic lesions anti-MCM2 frequently detected cells near the epithelial surface, while anti-Ki-67 did not. We conclude that MCM2 is detectable in 2-3 times more proliferating premalignant lung cells than is Ki-67. The promise of MCM2 as a sensitive marker for premalignant lung cells is enhanced by the fact that it is present in cells at the surface of metaplastic lung lesions, which are more likely to be exfoliated into sputum. Future studies will determine if use of anti-MCM2 makes possible sufficiently early detection to significantly enhance lung cancer survival rates. The 5-year survival rate for patients with lung cancer is approximately 15%, and it has changed only marginally in the last 30 years . Tumor stage is the most significant prognostic parameter for 5-year survival, but even patients with non-small cell lung cancer (non-SCLC) in pathologic stage IA disease (a tumor of less than 3 cm diameter located in one lobe of the lung and more than 2 cm from the carina without visceral pleural involvement, atelectasis, or pneumonitis, and absence of metastatic spread to regional lymph nodes) have a 33% chance of recurrence within 5 years after complete surgical resection (lobectomy with mediastinal lymph node dissection) . In this group of patients, the tumor most frequently recurs at distant sites, including the bone, liver, adrenal glands, and brain , and the size of the primary tumor does not appear to impact on survival . This suggests that even small and seemingly resectable lung cancers metastasize early. Data from randomized screening trials for lung cancer corroborate this observation. In these studies, more cancers were detected in resectable stages, and 5-year survival rates were higher in the screened population compared to the control population, but mortality rates (total death rate independent of time) from lung cancer were equal in both groups . For this reason, it is important to develop methods that will permit facile detection of bronchial mucosal abnormalities that are precursors for lung cancer before systemic shedding of tumor cells occurs. Such precursor lesions can be detected by sputum cytology and by bronchoscopy in large airways accessible by endoscopy. They include metaplasia, dysplasia, and carcinoma in situ (CIS), which are thought to represent progressive histologic correlates of carcinogenesis for squamous cell carcinoma . Current data suggest that 23% of current and former smokers have metaplastic lesions, and 2% have dysplastic lesions . However, not all such lesions progress to lung cancer. For instance, smoking cessation, which can be viewed as a form of active intervention, appears to result in a decrease of metaplasia rates from 27% in active smokers to 7% in former smokers . It is estimated that approximately 50% of CIS will progress to invasive cancer over a 6-month time period . However, of 9 patients followed by regular bronchoscopy at 6-month time intervals, 4 developed lung cancer at sites that had previously been biopsied and interpreted as normal bronchial epithelium . These results raise several important questions: A) Are there determinants in premalignant lesions that predict outcome, i.e., progression versus regression? B) Are there determinants in morphologically normal bronchial mucosa that predict outcome? C) Can lung cancer arise directly from normal bronchial mucosa or are histopathologic intermediates required? To address these questions, one promising approach would be the development of specific immunohistochemical markers capable of improving the sensitivity and reliability of methods currently employed to detect precursor lesions in histologic and cytologic specimens [9, 10]. Because proliferation is a requirement for lung cancer development, markers specific for cell proliferation are expected to prove useful. Two proliferation markers, proliferating cell nuclear antigen (PCNA) and Ki-67, have been extensively studied in this context. PCNA is a homotrimeric protein that binds tightly to DNA and to proteins involved in DNA replication and repair. It is essential for DNA replication and is found in all proliferating cells. However, because PCNA is also essential for several types of DNA repair, it may be present in non-proliferating cells [11, 12]. Ki-67 is an epitope of a nuclear protein recognized by the MIB-1 monoclonal antibody. The protein is frequently expressed throughout the cell cycle of proliferating cells, and it has not been detected in non-proliferating cells. During interphase, Ki-67 is located primarily in nucleolar and peri-nucleolar regions, and it appears to be associated with condensed chromatin . The function of the Ki-67 protein is still unknown , however, it appears to be required for cells to progress through the cell cycle [15, 16]. Immunohistochemical studies with PCNA and Ki-67 indicate that, in at least some cases, increased lung tumor staining for these markers correlates with decreased survival [17,18,19,20]. These proliferation markers can also be detected in premalignant lesions of the lung [21,22,23,24]. In this report, we describe the results of our comparison of one of these classic proliferation markers, Ki-67, with a new proliferation marker, MCM2 . MCM2 is one of six members of the minichromosome maintenance (MCM) protein family. These serve as components of "licensing factor," which is essential for initiation of DNA replication and for limiting replication to one round per cell cycle [26, 27]. The MCM proteins are also associated with replication forks and are likely to stimulate the unwinding of the parental DNA strands at these forks . We previously demonstrated  that, in normal tissues, MCM2 is detectable only in proliferating cells. Not surprisingly, it is also present in a high proportion of cancer cells. Our results showed a higher proportion of positively stained cells in premalignant breast lesions than with either PCNA or Ki-67 . Others have reported similar results for MCM family proteins compared with Ki-67 and PCNA for detection of a variety of premalignant cell types [29, 30], but a comparison of MCM proteins with Ki-67 or PCNA as markers for premalignant lung lesions has not previously been reported. 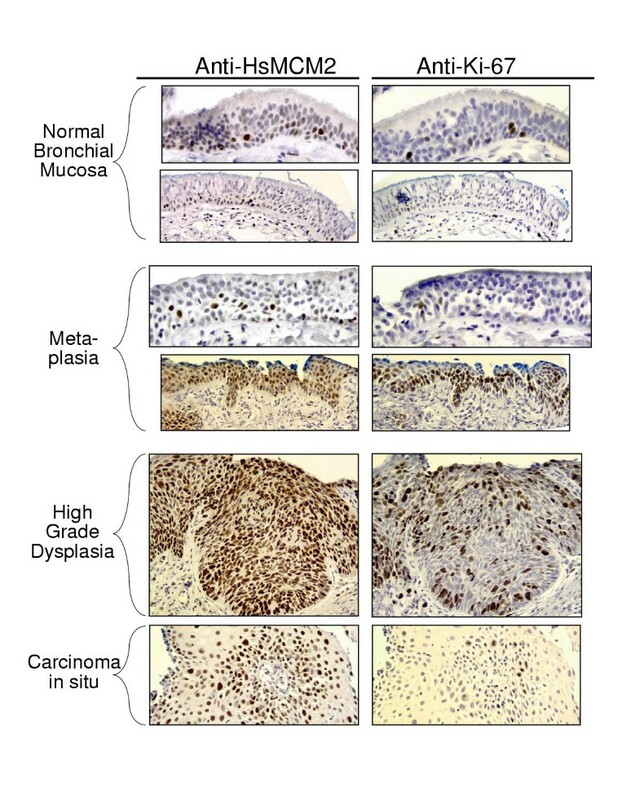 MCM2 and Ki-67 expression in bronchial biopsy specimens from patients at risk for lung cancer or with suspected lung cancer were studied by immunohistochemistry (IHC). We reviewed all pathology specimens from 106 patients that had undergone bronchoscopy with standard white light and laser-induced fluorescence at Roswell Park Cancer Institute from March 1998 to March 2000. Fourteen of these 106 patients were selected for further analysis based on the presence of abnormal morphology and the availability of multiple specimen blocks (4-17 per patient) for investigations. Of these 14 patients, the highest degree of abnormality in 4 was metaplasia, in 4 dysplasia, in 3 CIS, in 1 invasive squamous cell carcinoma, and in 2 invasive adenocarcinoma. Five of these patients were Caucasian women, 1 was an African-American man, and 8 were Caucasian men. All were active or former smokers. From each specimen block, 5 serial 4-μm sections were cut and placed on charged glass slides. Sections 1-4 were used for IHC, and section 5 was stained with hematoxylin and eosin. This latter section was reviewed and compared with the original slide used for diagnostic purposes. In 41 specimens, the morphology was comparable between the original slide and slide 5. These 41 specimens were used for IHC analysis and included morphologically normal bronchial mucosa, metaplasia, dysplasia, and CIS (see Table 1 for the numbers of specimens with normal and abnormal morphology). a The intensity of stain ranges from 0 (absent) to 3 (strong). b p-value < 0.016 for the paired difference t-test and Wilcoxon sign rank test. c p-value < 0.001 for the paired difference t-test and Wilcoxon sign rank test. d p-value < 0.034 for the paired difference t-test and <0.063 for the Wilcoxon sign-rank test. e p-value <0.010 for the ANOVA and Kruskal-Wallis tests of differences in MCM2 category means. f p-value <0.001 for the ANOVA and Kruskal-Wallis tests of differences in Ki-67 category means. g p-value <0.080 for the independent samples t-test between dysplasia and CIS within MCM2. h p-value <0.117 for the independent samples t-test between dysplasia and CIS within Ki67. i p-value <0.004 for the ANOVA and Kruskal-Wallis tests of differences in MCM2 and Ki-67 category means. Sections were stained with polyclonal rabbit antibodies raised and affinity-purified against the N-terminal portion of MCM2 . Parallel sections were stained with the MIB-1 mouse monoclonal antibody against Ki-67 (DAKO, Carpinteria, California). IHC was performed as described earlier . Briefly, sections were deparaffinized, and those to be stained with Ki-67 were subjected to microwave antigen retrieval in citrate buffer for 10 minutes, twice. Antigen retrieval was not required for MCM2. MIB-1 was used at a dilution of 1:50. The MCM2 antibody was used at a dilution of 1:500. The avidin-biotin detection method was employed on a Ventana Automated System (Tucson, Arizona). An irrelevant rabbit antiserum served as a negative control. Percentage, intensity, and distribution of stained cells were analyzed and scored for each antibody independently by two of the authors (DFT, JAH) with similar results. The percent of cells stained for each sample was estimated as a continuous number ranging from 0 to 100. The staining intensity was categorically coded as 0 (absent), 1 (weak), 2 (moderate), or 3 (strong). The average of both the percent of cells stained and staining intensity was calculated for each type of specimen (normal mucosa, metaplasia, dysplasia, CIS). To test for differences between the staining characteristics of MCM2 and Ki-67 both the parametric paired samples t-test and the non-parametric Wilcoxon rank-sum test were performed. To test for differences across specimen classes (normal mucosa, metaplasia, dysplasia and CIS) for each stain (Ki-67 or MCM2), the analysis of variance method as well as the non-parametric Kruskal-Wallis tests were used. To test specifically for differences between dysplasia and CIS for each stain, the independent samples t-test and the Mann-Whitney tests were performed. Both parametric and non-parametric tests were used because the distributional assumptions required for parametric testing may not be satisfied in all cases. All statistical tests assumed a two-sided alternative with a 5% level of significance. In normal bronchial mucosa, antibodies against both proteins, MCM2 and Ki-67, generated similar patterns: some cells in the basal and parabasal layer of the bronchial epithelium displayed immunoreactivity (Fig. 1). The proportion of cells staining for MCM2 was significantly (p < 0.02) greater than for Ki-67 (Table 1). In both cases, the intensity of nuclear staining was variable. Comparisons of staining by anti-MCM2 and anti-Ki-67 in parallel sections of normal bronchial mucosa and premalignant lung lesions. All objective lens magnifications were 20× except for the upper panels of normal bronchial mucosa and metaplasia, which were 40×. In premalignant lesions, evaluation of the staining by the two antibodies (Table 1) revealed significantly (p < 0.001) more frequent staining of nuclei within metaplastic lesions by antibodies against MCM2 than by antibodies against Ki-67. We also noticed that, in metaplasia, anti-MCM2 frequently stained both basal cells and cells throughout the entire thickness of the epithelium, while anti-Ki-67 primarily stained basal cells and cells in the lower half of the epithelium (Fig. 1, lower of the two "metaplasia" panels). Although the number of samples of dysplasia and CIS was too low to permit statistical evaluation of the differences between the two antibodies, we noticed that in every case of dysplasia or CIS, the frequency of cells stained by anti-MCM2 was as high or higher than the frequency of staining by anti-Ki-67. In fact, the same relationship was evident in the normal mucosa and metaplasia samples. Consequently, when the data for all 41 samples were combined, the difference in staining frequency between anti-MCM2 and anti-Ki-67 was highly significant (p < 0.001; Table 1). We observed variable staining in premalignant lesions. In many cases, within single lesions some regions stained while others did not, and the intensity of staining was variable from region to region and from cell to cell within regions. The level of variability was similar for both markers (Fig. 1). In the progression from normal mucosa to metaplasia to dysplasia, the results obtained with both antibodies suggested differences in staining frequency and intensity. For both antibodies, the mean percentages of cells stained and staining intensity were different across specimen categories (all p-values <0.010) and increased from normal mucosa to metaplasia and from metaplasia to dysplasia. Although the sample numbers are too low to draw a firm conclusion, the data suggest a possible decrease in staining frequency by both antibodies in the transition from dysplasia to CIS (p = 0.117 for Ki-67 and p = 0.080 for MCM2) (Table 1). No significant differences were detected between the average stain intensities produced by the two antibodies (Fig. 1; Table 1). This is the first comparison of MCM2 and Ki-67 expression in premalignant lesions of the human lung, and it showed that MCM2 was expressed in a greater percentage of cells in normal mucosa and in premalignant lesions than Ki-67. The proportion of cells stained for MCM2 ranged from 5% to 100% and for Ki-67 from 1% to 60% (Table 1). The average percentage of cells stained for MCM2 (11-64%) was higher than that for Ki-67 (3-34%). Statistical analyses of the frequencies of positively stained cells were done with the paired samples t-test and the Wilcoxon sign rank test. Both tests showed a striking difference (p < 0.001) in immunoreactivity between these markers across all 41 samples. This finding suggests that MCM2 may prove to be a more sensitive intermediate marker for lung cancer risk than Ki-67. However, there are several caveats to the use of MCM2 for assessing lung cancer risk. Most importantly, the ability of cells to proliferate, even though a hallmark of malignancy, is also a component of inflammation and healing. Thus, metaplastic lesions are frequently associated with chronic inflammation as exemplified by the presence of such lesions in 27% of current smokers but only 7% of former smokers . Furthermore, even high-grade dysplasia does not necessarily lead to invasive cancer . The fact that anti-MCM2 more frequently stains metaplastic cells at the epithelial surface suggests that it is more likely than anti-Ki-67 to detect exfoliated proliferating epithelial cells in cytological specimens such as sputum. However, this presumably higher sensitivity for premalignant cells could be accompanied by an unacceptably low specificity. Therefore, it is important to assess the positive predictive value of both markers, MCM2 and Ki-67, for lung cancer risk in cytologic and histologic specimens from a defined population at risk for this disease in a prospective study. Second, there has been a shift in the predominant type of lung cancer from squamous cell carcinoma to adenocarcinoma in the United States over the past twenty years [4, 31]. Since adenocarcinomas predominantly arise in the periphery of the lung and less frequently in the larger and more easily accessible airways, the utility of assessing morphological, molecular, and proliferative changes in these larger airways may be called into question. During the 1970s three randomized lung cancer screening trials were conducted in the US, and each of these trials used sputum cytology as one of the means to detect lung cancer at an early stage [32,33,34]. Aside from the major finding that screening did not reduce lung cancer mortality, several other important facts were uncovered. These included the findings that lung cancers detected by sputum cytology only, compared to chest X-ray only, had a higher rate of complete resectability (83% vs. 62%) and a higher 5-year survival rate (80% vs. 40%) ; that approximately one-third of the cancers detected by sputum cytology were adenocarcinomas and two-thirds were squamous cell carcinomas ; that sputum cytology detected 36% of all incident cases of lung cancer (excluding interval cases) ; and that sputum cytology detected 6/40 adenocarcinomas . It can thus be concluded that cytological examination of sputum specimens is able to detect adenocarcinomas at an early stage albeit with low sensitivity (15%). Staining of sputum specimens for proliferation markers, such as MCM2 and Ki-67, may increase that sensitivity by focusing the pathologist's attention on proliferating cells. In addition to its potential for detecting frank malignancy, staining for proliferation markers may also provide an estimate of the frequency of potentially precancerous conditions (metaplasia and dysplasia) in the patient's airways. This estimate may be helpful for determining whether to initiate other more costly evaluations for lung cancer detection. Third, since MCM2 and Ki-67 are both markers of cellular proliferation and required for cell cycle progression [15, 16, 26,27,28], the fact that anti-MCM2 stained a larger number of cells than anti-Ki-67 in every specimen examined suggests that Ki-67 may be expressed during a shorter interval of the cell cycle than MCM2. MCM2 is present throughout the cell cycle , while Ki-67 is predominantly expressed during S, G2 and M phase. Variability of cell cycle time in mammalian cells is largely a result of differences in the duration of G1 phase. Thus, specimens that consist of a relatively slow growing population of cells and consequently a higher proportion of cells in G1 phase would show staining of more cells with MCM2 than Ki-67. Conversely, specimens with cells dividing at a high rate would show staining of near equal numbers of cells for MCM2 and Ki-67. Thus it is likely that staining for both, MCM2 and Ki-67, will provide information about cell cycle distribution and possibly growth dynamics not obtainable by staining for either marker alone. Finally, the data presented on MCM2 expression by IHC were obtained with affinity-purified polyclonal rabbit antibodies. The supply of these purified antibodies is limited, and their use for MCM2 immunostaining is therefore not uniformly available. Although additional polyclonal antibody preparations can be generated by immunizing more rabbits, the best solution would be the commercial availability of specific MCM2 monoclonal antibodies. Fortunately, several of these are now available and useful for Western blotting and staining of frozen sections. The utility of these antibodies for IHC in paraffin-embedded specimens is being investigated. We have confirmed that polyclonal anti-MCM2 antibodies provide consistent, reliable staining in routinely fixed tissues without a requirement for antigen retrieval. Results obtained are easy to interpret, since there is a striking difference between normal bronchoepithelium and premalignant lesions. Thus MCM2 is an easy-to-use marker, which has great potential for assessment of progression and regression of morphologically abnormal lesions in future primary lung cancer prevention studies and for the early detection of lung cancer in screening studies. We thank both referees, whose constructive comments led to a greatly improved manuscript. This research was supported in part by a Research Award from the Roswell Park Alliance Foundation to DFT, a grant (GM49294) from the National Institute of General Medicine to JAH, and a Developmental Funds Award from the Roswell Park Cancer Center Support Grant (P30 CA16056-24) and the Roswell Park Alliance Foundation to GB.